Description: Experience the thrill and excitement of the Pro Football Hall of Fame without making the trip to Canton, Ohio! 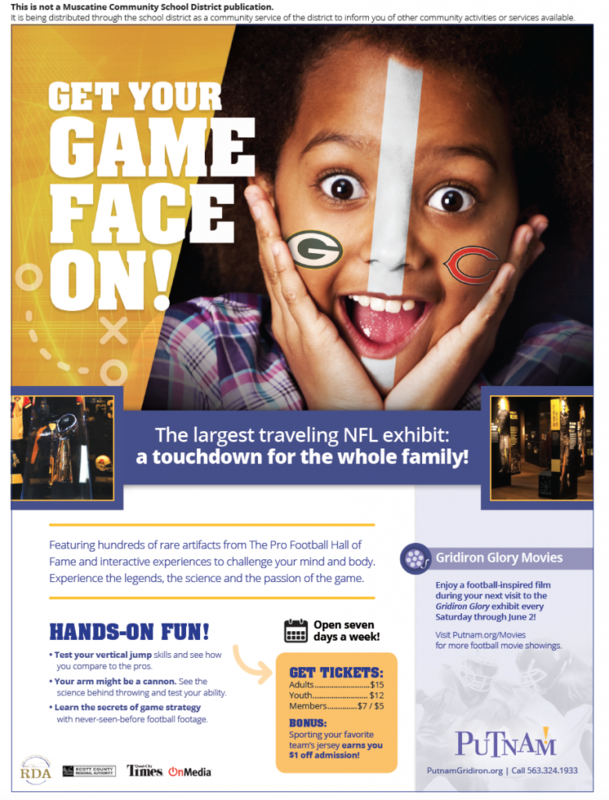 See Gridiron Glory: The Best of the Pro Football Hall of Fame today at the Putnam Museum & Science Center! Gridiron Glory is the most extensive and comprehensive traveling exhibit ever done on America’s most popular sport, offering an immersive fan experience. See the best of the Pro Football Hall of Fame’s vast holdings — including 200 artifacts, rare photos and one-of-a-kind documents. The 7,500 square-foot exhibit features spectacular footage from NFL Films’ unparalleled film archives and a series of interactive exhibits that challenge both mind and body. It also includes a 500-square-foot area dedicated to the Chicago Bears and Green Bay Packers.